Soon after WWI came to an end in November of 1918, an estimated 500,000 African Americans emigrated from the south to the north as part of the Great Migration. Paranoid fear of Communism, combined with shifting labor markets, economic instabilities from post-war unemployment and inflation, and African Americans demands for racial justice stoked the fears of white people who formed mobs and attacked black communities across sixteen states and D.C. Although exact numbers remain unknown, approximately 200 African Americans were killed between May-October of that year. On its 100-year anniversary, "Red Summer," an installation by award-winning artist and musician and 2018-2020 Gund artist-in-residence Paul Rucker combines original historical artifacts with a timeline of political, social, and economic events between 1900 and 1925, the years leading up to and following the Red Summer, and a timeline representing our own moment: 2000-2019. Opening reception: Thursday, January 17, 5 - 8 p.m.
Co-sponsored and co-presented by the Center for the Study of American Democracy. The Gund Gallery exhibitions and programs are made possible, in part, by the Gund Gallery Board of Directors and the Ohio Arts Council. 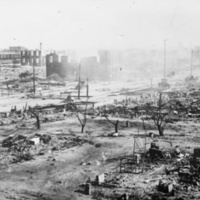 Image: "Ruins after the race riots, Tulsa, Okla.," June 1921. Library of Congress, Prints & Photographs Division, American National Red Cross Collection, LC-DIG-anrc-14738.